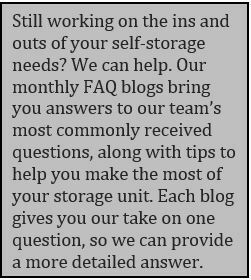 Is Montgomery Self Storage a Member of the Texas Self Storage Association? From time to time, a potential customer will ask if we are affiliated with trade organizations. Yes, we are! Sure, we take great pride in our small business model. Our staff has a connection with our customers at each location and puts the focus on doing things right. It’s important that, as we grow in numbers, we don’t change our personal approach. But it’s also beneficial to keep our fingers on the pulse of the industry. Connecting with other self storage owners offers insight into best practices around the state. Hearing what works—and sometimes, more importantly, what doesn’t work—for others can improve our own operations. By joining the Texas Self Storage Association (TSSA), we instantly had access to this wealth of knowledge. Membership in TSSA affords us many benefits—perks we can pass along to our customers. TSSA is a not-for-profit trade association founded in 1986 to bring self storage owners and operators together to teach each other how to improve their own businesses and the industry in general. From its humble beginnings with just 10 facility owners, it is now the largest state self storage organization in the country: Today, there are more than 3,800 member facilities. The association is wonderful for self storage operators just starting out. TSSA publishes a number of guidebooks to help launch—and maintain—a successful facility. But it’s equally valuable to veteran owners like us. As the industry changes—through enhanced construction practices that help unit owners shield their items from weather and improved technology that enables greater protection for units, for example—it’s beneficial to learn trade secrets from those who’ve implemented new systems. We’ve read that some 85 percent of all business failures occur in firms that are not members of their trade association. Our TSSA membership is a badge of our dedication. Our customers can trust that we’re in it for the long haul. Plus, our customers can feel confident that our practices have been “field-tested” to ensure they make sense and are successful. We listen for innovations that could serve our customers well to continually evolve our locations into state-of-the-art facilities.